For a country like Ethiopia, which lacks a properly-funded foreign office – let alone a foreign aid budget – extending influence internationally is no easy feat. Moreover, at a time when neoliberal globalisation and powerful nations’ military interests dominate international relations, leaders of weaker countries have to balance a number of competing imperatives. Nonetheless, Abiy seems to have successfully leveraged Ethiopia’s geostrategic significance and existing regional rivalries a year into his tenure, allowing the country to access greater financial support and enhancing Ethiopia’s image. Under Abiy, Ethiopia’s foreign policy has focused on establishing strategic partnerships. Unlike formal treaty-based alliances, these more flexible arrangements offer room for manoeuvre and have been struck with countries in the Horn and Middle East as well as with the likes of China, the US and Europe. Developing partnerships with as many critical actors as possible has allowed Ethiopia to spread its strategic risks and helped it maintain its autonomy. These strategic partnerships serve many purposes. Among them are avoiding conflict, attracting financial support, coordinating on security matters, promoting capacity-building and knowledge exchange, and enhancing Ethiopia’s international profile and reputation. Abiy has also demonstrated a keen interest to expand Ethiopia’s defensive security footprint. The country already plays a critical role in African Union’s peacekeeping operations in Somalia and elsewhere, but it has also been the single largest contributor to UN peacekeeping operations in the world. Abiy’s administration has recently restructured the Ethiopian National Defence Forces (ENDF) and the military has announced plans to re-establish a naval force, adding a distinct security component to Ethiopia’s defensive capabilities. Under Abiy, Ethiopia’s approach to regional powers is going through a significant reboot. After successfully making peace with Eritrea, the prime minister has been pushing vigorously for regional economic integration, which he has described as one of the three pillars of Ethiopia’s renaissance. He has spoken of the shared cultural values of people in the region and how their social and intellectual capital can be harnessed for mutually beneficial ends. While details of his regional plans are not yet public, Abiy has said that his vision for the Horn of Africa is informed by “Medemer”. This is a philosophy of collaboration that appeals to peaceful co-existence, equal partnership, and equitable sharing of benefits and burdens rather than muscular diplomacy and force. By drawing on the resources of the region, Abiy aims to create new alliances and opportunities to end the colossal waste of human potential. In doing so, his vision aims to make nations and peoples in the Horn stakeholders in regional peace and stability by creating new sources of optimism for a more positive future. Beyond the Horn, a critical feature of Abiy’s strategic hedging is his focused engagement with the Middle East. Without siding with any one side, Ethiopia has been developing relationships with several countries to spread risks associated with being a poor economy in a volatile region. Ethiopia has established economic partnerships with wealthy Middle Eastern countries such as the UAE, Qatar, and Saudi Arabia, which was critical to averting balance of payment’s crisis. However, Abiy has also now begun to act as a peace broker between feuding Middle Eastern actors themselves, a significant achievement for any country seeking a respectable place in the community of nations. Ethiopia’s strategic relationships in the Middle East are driven by the dictates of realpolitik and the needs for strategic and economic interdependence. Among other things, these partnerships can help reduce the risk of confrontations with strategic adversaries such as Egypt. The Grand Ethiopian Renaissance Dam (GERD) being built by the Ethiopian government is a major politico-economic infrastructure with considerable regional implications. While Abiy has done extremely well to assuage Egyptian concerns over the GERD so far, his strategic partnerships with Middle Eastern countries could serve as a hedge against unnecessary confrontations and could even serve as a bridge that plays a constructive role. 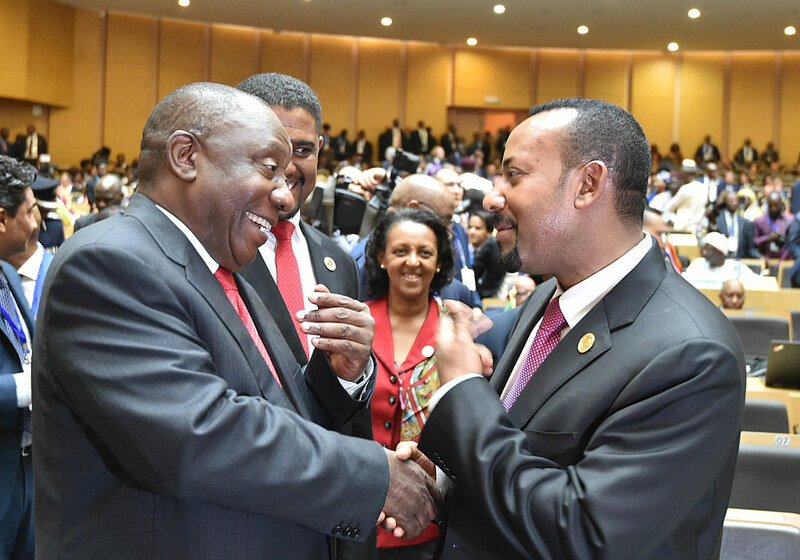 There is no doubt that Abiy brought new enthusiasm, energy, and vigour to Ethiopia’s foreign policy, effectively resetting the country’s international priorities. Charismatic and decisive, the prime minister has often spoken of Ethiopia’s proud place in history and sought to enhance its international status. However, if Abiy wants to fundamentally transform Ethiopia’s foreign policy priorities and goals into his next year, and re-position the country’s global engagement, he will need to crystallise his distinctive practice. He will have to: 1) clearly define Ethiopia’s foreign policy agendas and goals; 2) establish the framework that guides Ethiopia’s relations with major and small powers; 3) avoid ad hoc foreign policy formulation at all costs; and 4) overhaul the Ethiopian Foreign Service and create a professional, rational and capable institution able to develop evidence-based policies. For the first time in a long time, Ethiopia is beginning to play a bold and constructive regional and global role befitting its geostrategic significance. However, in order for Ethiopia to confront intractable international challenges and advance its vital national interest in the long term, it still needs a foreign policy blueprint to guide its actions.